If you have a dog, don’d do this! Just. Don’t. Recently, photos have been floating around of dogs that have been groomed into geometric-headed creatures. The original photos date from, at least, last December. The look is supposed to be cute. Some pics show dogs with the fur on their heads trimmed into circles. Others have their fur trimmed into squares. Like these pooches. As noted on website Hachima, people online in Japan (and elsewhere) were quick to point out the obvious: These critters look like the dogs in Minecraft. Most likely, it’s unintentional, but man, it’s uncanny. Here are dogs in Minecraft. Again, a square-groomed dog. See what I mean? And via Twitter user RavenTofu, we’re now full circle. 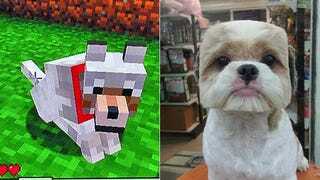 If you have a dog, please don’t turn him or her into a Minecraft character.